On iOS, click	Email	Database to email your database file to the address you enter. Or click Export Database to save your database file to the selected cloud storage location. On iOS 11, the Export Database button will also give you the option to save your database file to a local file location, but it's better to back up to a cloud storage location in case your device is lost or damaged. On Android, click	Email	Database to email your database file to the address you enter. The Email Database button will also give you the option to send your database file to other apps or cloud storage locations. You can also click Export Database to save your database file to a local file location, but it's better to back up to a cloud storage location in case your device is lost or damaged. If you saved your database to a cloud storage location, click Import Database, and select the file from that location. If you saved your database to a local storage location, click Import Database, and select the file from that location. You can only do this on iOS 11 or Android. If you emailed the database, you can open the email on an iOS device, click the database, and copy it to Set List Maker from the share menu. You must have Set List Maker running, with the correct database selected, before doing this. On an Android device, you can open the email and save the database to a local folder like the Downloads folder, then open Set List Maker and use the Import Database button to select the file from that location. On iOS 8-9, you cannot export directly to iCloud. On iOS 11, you can export to destinations in the new Save to Files option, but a confirmation message won't appear. When exporting with the new Save to Files option in iOS, you should not save your database into On My [device] > Set List Maker if you intend to delete and reinstall the app. That folder will be deleted when you delete the app. 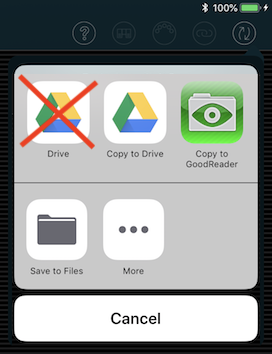 When exporting to Google Drive from iOS, you have a few options: Drive, Copy to Drive or Save to Files. The Drive option incorrectly saves your database as a binary file, so you should avoid that option. Instead, you can use the Copy to Drive or Save to Files option. If you have already uploaded files with the Drive option and need to access them, you can download them from the Google Drive app or website on a computer, then delete the copy in Google Drive, then re-upload the file you just downloaded. We	have	reported	this issue to Google. You can export as often as you like, and save the exported files as backups. Each exported filename includes the database name and the export date and time for easy archiving. You should not rename the exported files, because the app looks for the info within the filename when importing. If you want to organize your exported files other than by name and date, you can group them into folders. When you import a database, your current database will be overwritten by the imported file. There is no way to merge differences between your current database and the imported file. There is also no way to undo the import. Set List Maker will show you the database name, source device and date in a confirmation message before importing, to make sure you are importing the right file. The exported file contains all your songs, set lists MIDI presets and document metadata. It does not contain your database settings or layouts. You can export and import layouts separately; see the "Sharing Layouts" section in the layouts tutorial. If you've attached documents or recordings to your songs, the exported database file will not contain these documents or recordings, but will contain metadata about them (like document orientation or recording volume) and links to them (one link for iOS devices and one for Android devices). This means you would only have to link your documents to your songs once on each platform, then if you copy the same documents to each device, they will be linked to your songs automatically on the other devices. If you switch to BandHelper, you can sync all your database data and attached documents and recordings automatically, with cloud-based backups, and with options for band members to keep personalized versions of some data.